Being in debt is not a great feeling. I know, I’ve been there. It is heart-breaking to see your income being dispersed away to your creditor’s account. Studies indicate that almost 80% of workers in the US rely on their monthly salary to manage the next month’s expenses. Just less than half of Americans over the age of 18 years are able to cover a sudden emergency that needs an expense of $400. Being neck deep in debts from creditors creates stress and can be overwhelming when you realize how much money is being wasted on paying for something you put on your credit card or, even worse, paying for interest on those things. However, amidst the distress and apparently unending debt, there is a ray of hope- The Dave Ramsey Snowball Concept. It helps you in managing your debts and eventually paying them off. It’s popular because it work. It helped me become debt free and I’m sure it can help you! What does the debt snowball concept mean? In simpler terms, the debt snowball method is a way to reduce your debt. If you can recall some moments from your childhood when you played in the snow, you will remember that when you packed some snow in the form of a tiny ball and rolled in through the snow-clad backyard, it became bigger as it rolled down. The same technique can be applied to get out of your debt. This technique is known as the debt snowball method and was made popular by Dave Ramsey. With this method, you start off with a small amount of money that you want to use for repaying your debt. You focus first on paying off the debt that is the lowest. You make minimum payments to all your debt and throw every single extra penny you can at the debt that is the lowest. Once you are able to pay off the lowest debt, you target the next lowest debt and begin to pay it off. Once you are done with that, move on to the next debt and roll the money that you were previously paying on the lowest debt to pay off the second one. Let’s break this method in distinct steps to understand how this method works. Step 1– The first step is to list all your debts from the lowest value to the highest value in an increasing order. Please note that you don’t have to consider the interest rate while arranging these debts unless you have two debts that are the exact same amount due. In that case, list the one with the highest interest first. Step 2– Make minimum payments on all the debts, except the debt with the lowest value, i.e. the debt that occupies the first position in the queue mentioned above. Step 3– Try to make as much payment to the lowest debt as possible. Every extra penny your budget can spare should go towards this debt until it is paid off. Step 4– Once the first debt is paid off you’ll move onto the second debt. Instead of paying the minimum, you’ll add in whatever you were paying towards your first debt. Step 5 -Repeat these steps until all your debts are completely paid for. Let’s break this down with the help of a more relatable example from our daily life. Jane and John have six loans to pay off. They organize these loans in order from smallest to largest. $116 overdue electric bill on payment plan – $25 minimum payment. $419 copay for medical visit – $25 minimum payment. $1,281 bill for their credit card purchases on their last vacation – $32 minimum payment. $5,200 credit card bill for miscellaneous purchases – $136.00 minimum payment. 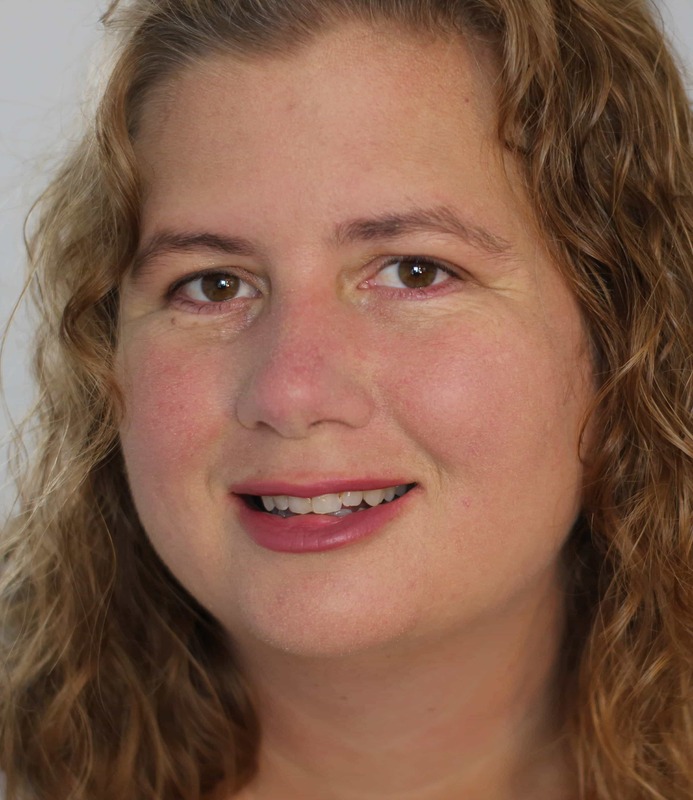 $12,482 loan for Jane’s car – $218 minimum payment. Jane and John want to use the Dave Ramsey Snowball Method. They make the minimum payments on all their debts except that for the electric bill. They figure out that they have $700 total available in their budget they can put towards debt. 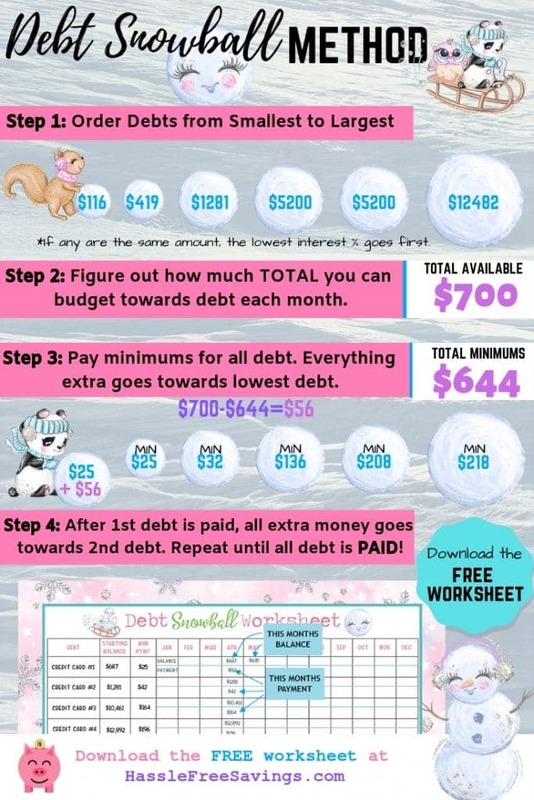 The minimum payments are $644 so that leaves $56 as their debt snowball. They add the $56 to the $25 minimum for the electric bill this month and pay just the minimums on all their other bills. Next month, only $35.43 remains on the electric bill so they pay that off and put the remaining $45.57 towards the medical copay. Debt 1 has now been paid off and John and Jane’s snowball has increased to $81.00 ($56 original plus $25 from paying off Debt 1). That is $81 extra each month they can use to pay down the copay bill. 6 months later, the medical bill is paid off and all extra money can be thrown at credit card #1. The debt snowball is now $106.00. Each debt that John and Jane pay off increases the debt snowball they have to throw at the next debt on the list. If John works to pick up a few extra shifts or Jane is able to make some side income, the rate of debt repayment can increase drastically if that extra income is applied towards debt. Why the Dave Ramsey Debt Snowball Concept Works. 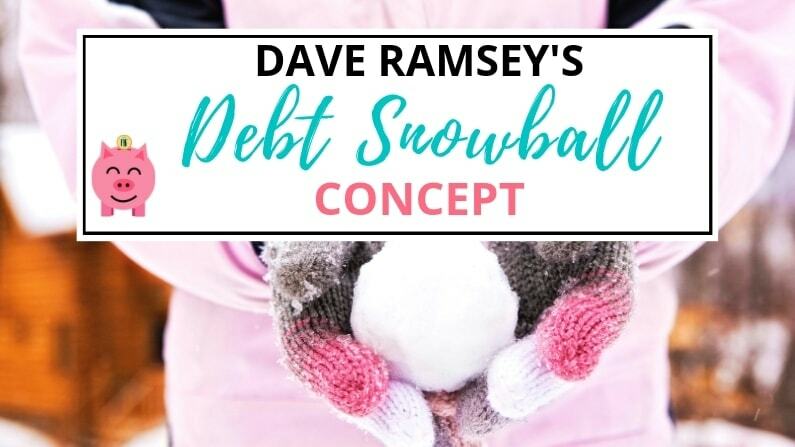 The Dave Ramsey Snowball concept works because it targets the lowest debt first. Had it been the other way around, i.e. targeting the largest loan first, John and Jane would have remained stuck with a monumental amount for a long time. Targeting the lowest loan brought instant results and motivated him to keep moving ahead and ticking off all the loans one by one. By the time John and Jane reached the higher debts, they had freed-up a lot more money than before. Seeing balances start to reduce more quickly motivated them and they finally became debt free. This method can be used by anyone to pay off all loans one by one. Like John and Jane, you also have to work the steps on this journey. Gather information about all the debts and loans that you have to repay. Include all creditors in the list, including your friends and family, bills, loans, credit card dues, and any other bill you can think of. 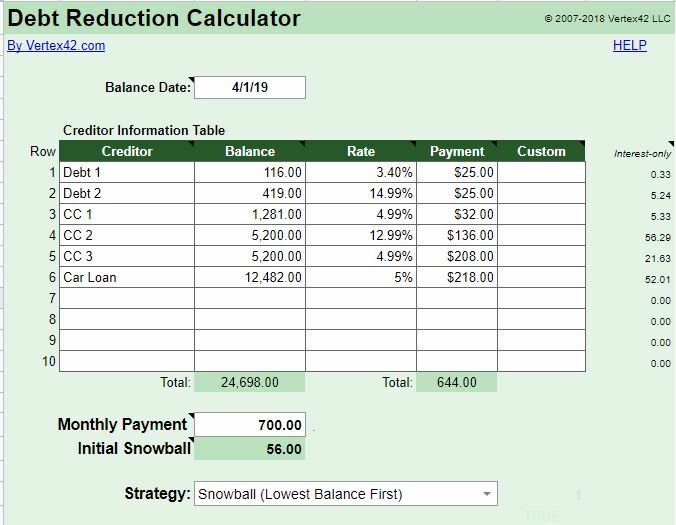 I created six different debt snowball worksheets to help get you started and keep you motivated. You can download them FREE below! Paying the minimums for each debt ensures you won’t be accruing unnecessary late fees or, worse, damaging your credit. 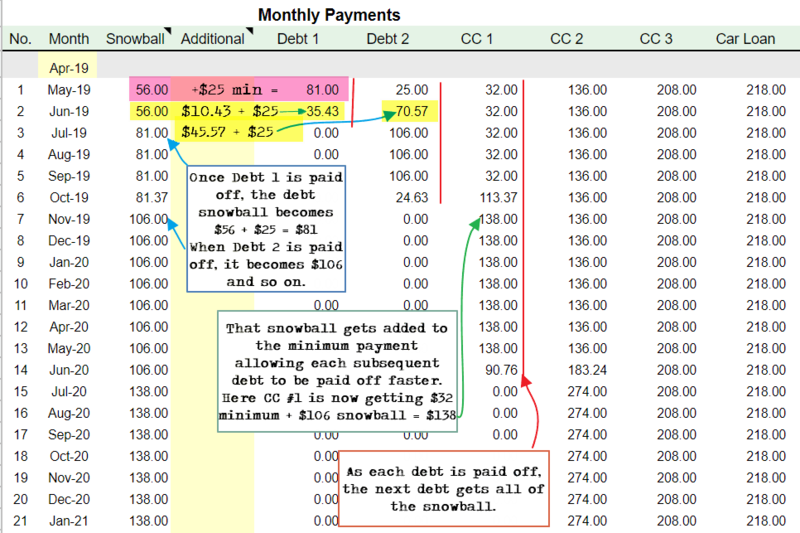 When using the debt snowball method, ALWAYS pay the minimums for every debt. As you target your debts, it is important to find extra cash from wherever you can. Sell unwanted stuff in a garage sale, ask for an increase in your salary or ask for extra hours, restrain from frequent, avoidable expenditures, look for part-time jobs etc. You should also let go of indulgences and monthly subscriptions that can be avoided, at least until your pay off your debt. Knock out the smallest debts as soon as possible and move on to the next smallest debt. If you want to see quickly how long it will take you to pay off each debt, the best way to do that is using a pre-designed debt payoff spreadsheet. I used the Google Sheets Debt Payoff Template from Vertex32 for my examples. They also have an Excel version of the Dave Ramsey Snowball Concept and you can choose between the Snowball method or the Avalanche method of debt payoff. These free printable worksheets are designed to help you see how much you have paid towards each of your debts and how much you have left. 3 different colored designs are super cute to hang on your fridge or use in your budget binder. All three designs are available with monthly headers (January start) or without headers so you can fill in and start this month if you want! Sign up to our newsletter below to receive them or click here. Don’t let debt in your life stress you out and have power over you. With the help of the Dave Ramsey Snowball Concept, you can get yourself on the path towards debt freedom. Trust me, it is worth it! 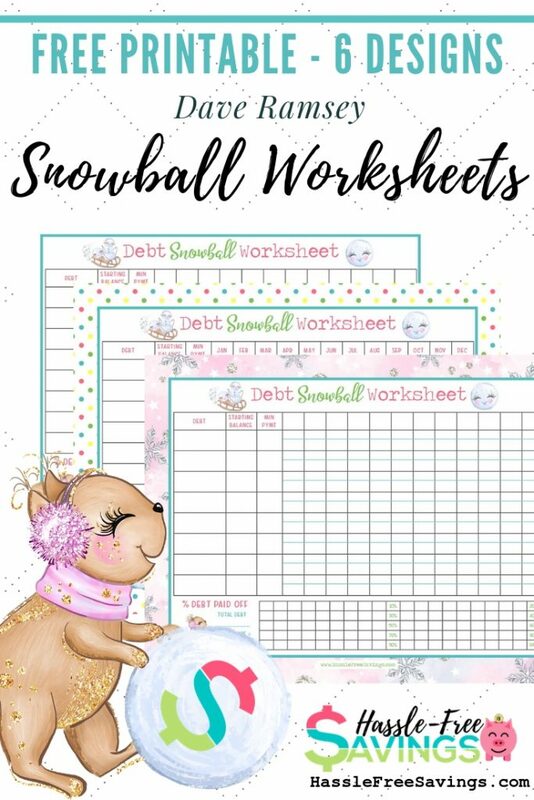 Use my FREE printable debt snowball worksheets to help you track your payments. To keep yourself motivated, at the bottom of these worksheets I’ve placed a tracker so you can track what % of debt you have paid off. Stay motivated, you CAN do it!